This year my family is doing an ugly Christmas sweater contest, something we've never done before. And with Christmas being next week (WAIT WHAT?!) I thought I better start planning out my sweater. I took to Pinterest because where else would you find the tackiest Christmas sweater inspo? to get inspired. (Pssst, I have a whole post dedicated to ugly sweaters click here to read it.) I searched and just didn't find anything that A) I liked or B) that wasn't inappropriate. I was on Youtube one day and came across this video by LaurDIY and she was making ugly Christmas sweaters. I watched and found my sweater! I was so excited that I started rummaging through my closet and craft cabinet to find supplies. After taking inventory I needed quite a few things to make this sweater. I went to my local Michael's Craft Store and Target, found what I needed and was set to make it. This is literally the easiest DIY ever. Even if you aren't a big crafter or DIYer it's foolproof. You're just glueing things onto a shirt. 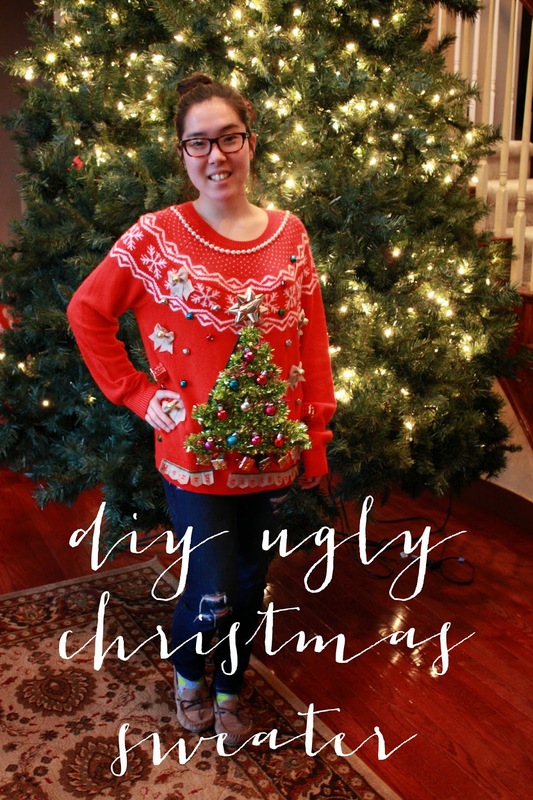 So without further adieu, here is my ugly Christmas sweater DIY! Step 1: Once you've gathered up all your materials lay out your sweater. Take your garland and start folding/zigzagging it into a Christmas tree shape. Step 2: Once you have your Christmas tree shape take your piece of felt and cut it to roughly the shape of your tree. It doesn't have to be perfect. Step 3: Hot glue your tree to the felt piece then peel off the paper backing and hot glue the back of the adhesive. Then position your tree onto your sweater and press firmly for 15 seconds to adhed. Step 5: The fun part! Lay out all your decorations onto your shirt. The more the merrier! You can never have to many! Step 6: Tacky Glue the decorations onto the shirt and Hot Glue the ornaments to the Christmas tree. Hold each for about 10 seconds till the glue is dried. Step 7: Your shirt is done! Let it dry on a flat surface for at least 24 hours to let the glue fully dry. There you have it, an easy, DIY Christmas sweater with lots of tacky! It's to the point of it's so tacky that it's cute, ya feel? Since there is so many pieces on it I would refrain from wearing it for long periods of time and doing any physical activity in it like dancing, jumping, hugging, etc. If you know how to sew (I don't obviously that's why I'm using glue #lol) feel free to sew everything on to hold better. Obviously I wouldn't recommend washing it in the washer/dryer. If you do get a spot on it just spot clean it. You can be as creative as you want with it! Go wild on it. Like let all the tackiness out! Don't hold back! Happy DIYing and Merry Christmas! "glitter, buttons, bowse and bells, find a sweater that's as ugly as hell"